As usual, I’d been monitoring the forecast as the weekend approached and it was pretty unequivocal: snow first followed by rain, rain and more rain. I’d just about resigned myself to a lazy weekend indoors, but late on Friday night, decided to check the forecast one more time. 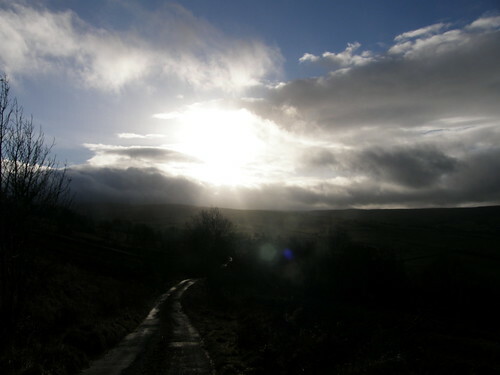 And lo and behold, between the two weather fronts, it seemed that there would be a few hours of much brighter weather. I hastily chucked some gear into my rucksack and retired to bed with the Ordnance Survey’s Lake District South East sheet. Accordingly, I was out early the following morning. Our driveway was coated with a thin film of what had clearly fallen as snow, partially thawed and then refrozen into a crackling, slippery surface. But the road through the village was clear – it would be fine! A mile down the road and I was driving on snow. Another mile and I was passing abandoned cars and feeling the wheels spinning as the car struggled to to gain traction on a short, sharp little hill climb. The main road, when I reached it, was only marginally better. In Milnthorpe, I stopped at the petrol station to ask about the road ahead and to weigh up my options. To the North apparently the roads were likely to be bad. To the South I would find no snow at all. I deliberated for a while and then decided to head home. I took a circuitous route and found that the snow had indeed petered out in just a couple of miles. 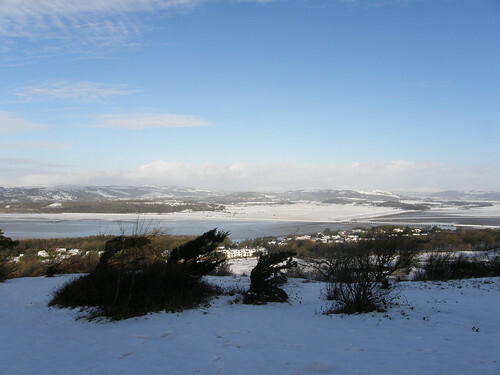 Silverdale seemed to be on the dividing line, with green fields on the south side of the village but a thin white-over covering on the north. I’d already formulated Plan B: drag the kids out in search of snow. 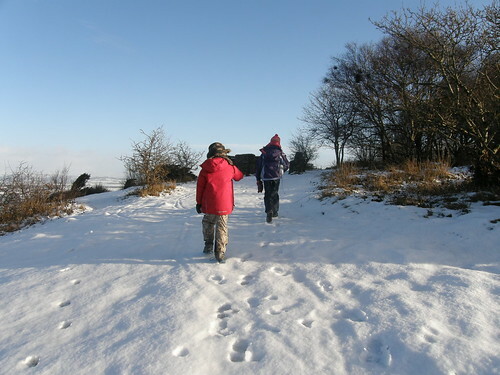 Little S couldn’t be enticed away from the goggle-box, but A and B were both keen to go seeking the white stuff, with the proviso that we must take sledges and find somewhere to use them. 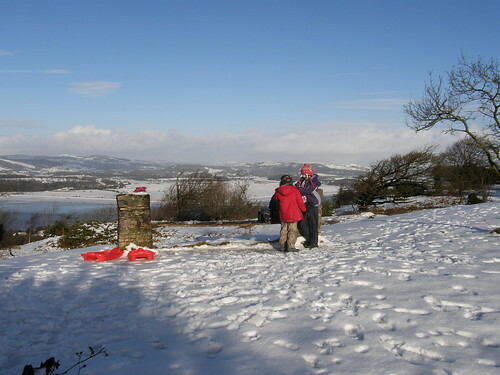 Arnside Knott from the Tower. 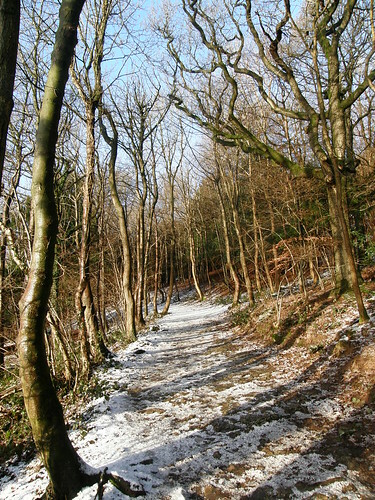 In Eaves Wood, there was more mud than snow, and a lot of water dripping from the trees, but once north of the wood we found enough snow to sledge. 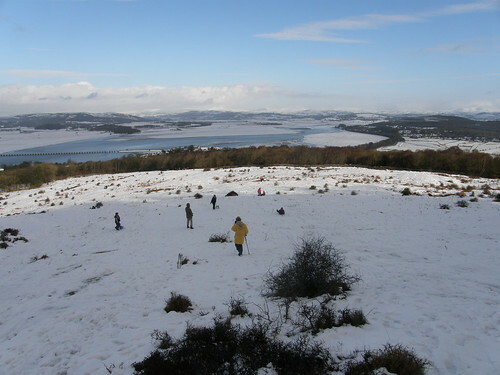 It was as much ice as snow however and the sledges skittered down even a slight slope at an alarming speed. Once onto the Knott, the snow was still pretty patchy and I began to worry that I had lured A and B out with false promises. 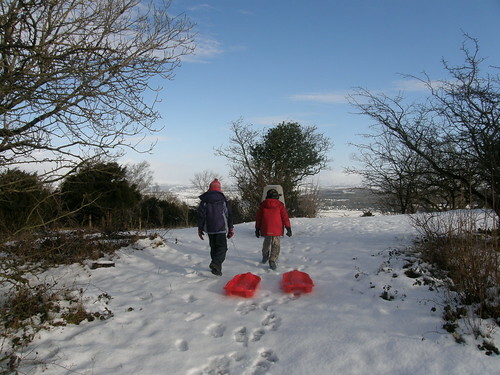 Not that I felt too guilty about that – it was fabulous to be out and they were clearly enjoying themselves, although both seemed to be quite tired, or at least, that’s what they told me when they insisted that I should carry the sledges. 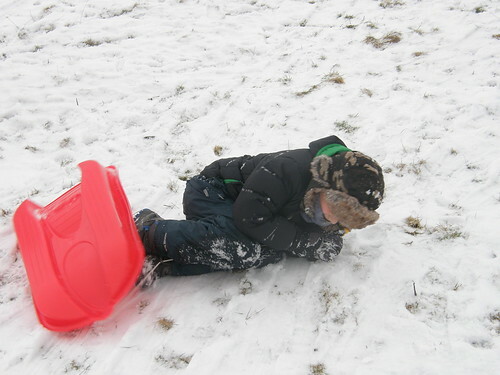 We kept giving the sledges a try, but it was still too icy to commit to anything but the gentlest of slopes. Near the top of the Knott however, the snow was slightly deeper, although still with an icy crust. The view across the Kent, of Cartmell Fell and Whitbarrow Scar was wonderful, but the higher hills beyond were obscured by cloud, so perhaps it was serendipitous that I had turned back from my planned trip to the Lakes. 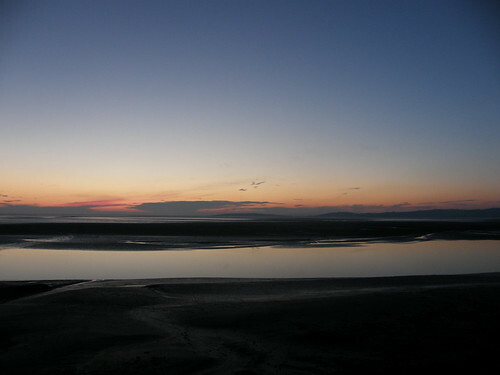 Along the shores of Morecambe Bay to the south we could pick-out green fields where no snow had settled. 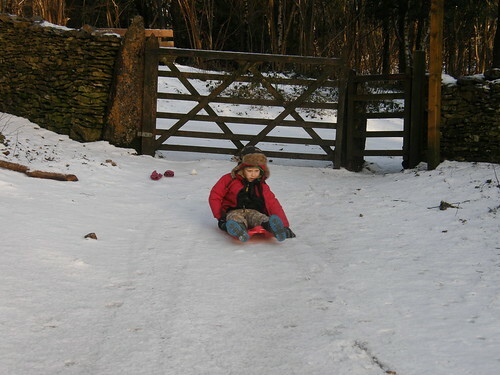 A and B found another place to sledge…. …and then we paused for hot black-currant cordial with a view. 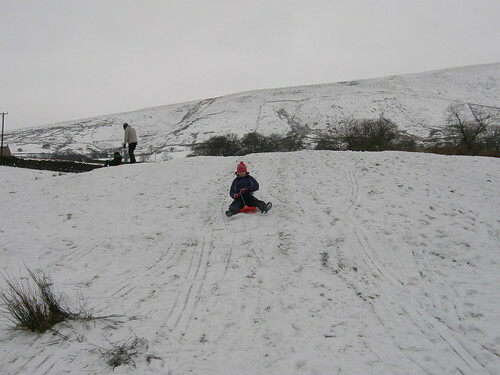 …thinking of heading home for some lunch, but decided first to check on the sledging possibilities in the large open field on the north side of the Knott. 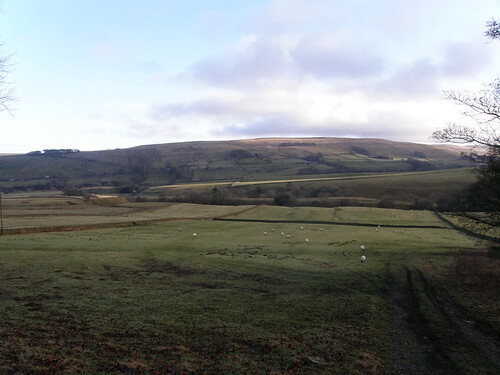 …slightly right of centre in this photo, on a long sedate run which will take her almost down to the far trees. 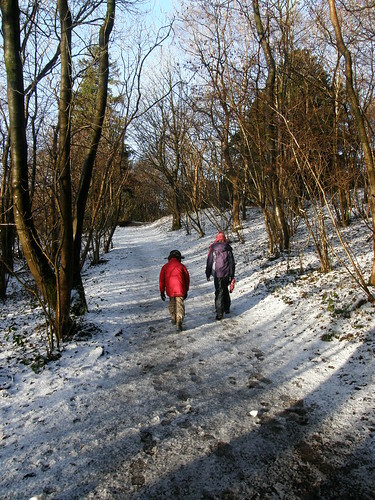 Two of those, and two reascents of the hill and she declared herself ready to head home. 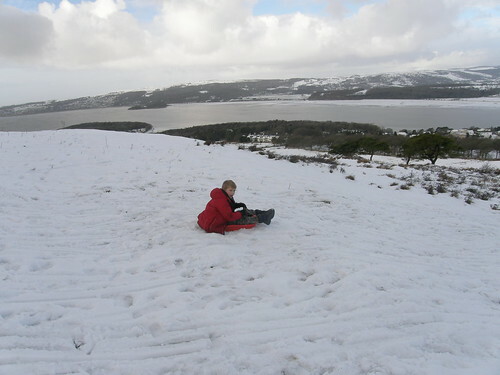 Whilst A made her steady, controlled progress down to the bottom of the hill, B made several wild careering runs down the steep top part of the slope, all ending with him tipping out of the sledge or crashing into a bush or a patch of heather. They’re very different. This photo of the two of them, which really belongs a little earlier in our story, made me smile, I think because it reminded me of..
Well, I know, it’s not very similar. But it was in my mind because we’ve been rereading the stories together. What a delight it is to have an appreciative audience to read them to. All three of the ankle-biters enjoy them and find them funny, despite, or perhaps because of, how many times they’ve heard them before. The next day the snow was gone. It’s raining again now, of course. "Nothing, Pooh Bear, nothing. We can’t all, and some of us don’t. That’s all there is to it." "Can’t all what?" said Pooh, rubbing his nose. Around this time of year an important milestone, a personal turning point, is reached. The happy coincidence of a bright afternoon and a window of opportunity in the welter of work and family responsibilities will have me barrelling home, flinging on a coat, lacing up my boots (metaphorically at least) and getting out for a first post-walk daylight stroll of the new year. Usually, it arrives sometime in February when the snowdrops are poking toward the light and perhaps a few primroses are flowering. 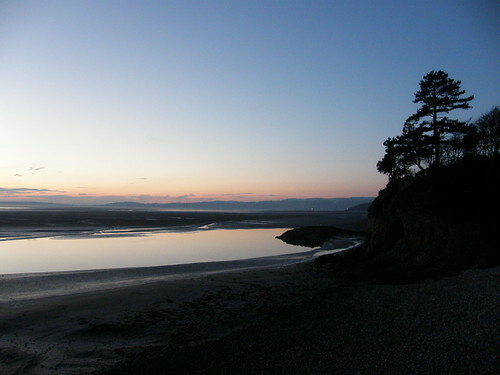 It’s almost a dead-cert that I will head down to the Cove to try to catch the sunset, and that I will arrive too late, but that I won’t mind too much, will simply be glad to be out. This year it happened much earlier, just a couple of days ago in fact. A was keen to join me. Although the sun had set, the moon was bright in the south east and beside it a first ‘star’ which I think must have been Jupiter. That brief saunter seems to have turned a switch somewhere in the inner recesses. It’s as if the new year has begun in earnest and suddenly I’m full of schemes and pipe-dreams again. Things I’d like to return to in 2013. High on the agenda is messing about in boats: to do some sailing; to buy, beg, borrow, blag, build a Canadian Canoe. 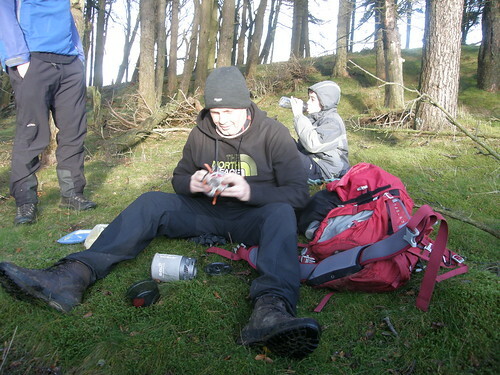 I’m also very keen to fit in a wild camp sometime, somewhere. (To ‘fit into’ a wild camp is the principal problem here: sleeping bags tend to be one size, which in my case doesn’t fit all). 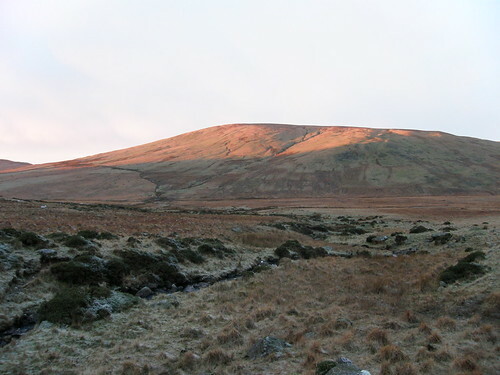 After the Garsdale to Kirkby Stephen walk which CJ and I did late last year, and after avidly reading many of the posts and much of the information over at The 214 Wainwright Fells: without a car I’m also keen to try some more point-to-point routes using public transport. I just received a message from WordPress to tell me that it is four years to the day that I started this blog. Well, well, bloody hell, as John Cooper Clarke might have put it, 5 years of inanities: who’d have thought it? Here’s to the next 5 years, and to all of you who have occasionally scanned through my wittering or have been kind enough to take the time to comment. Prost! Sláinte! Santé! Skål! Arriba, abajo, al centro, para adentro! L’chaim! Cheers! 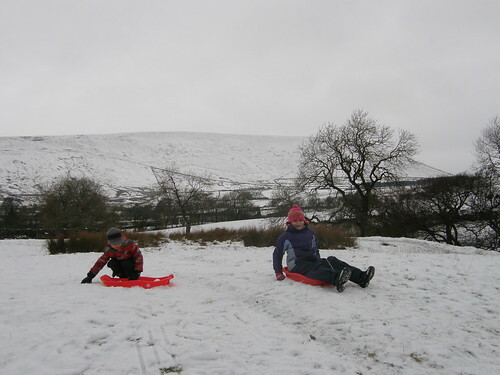 With a disappointing lack of the white stuff around home this weekend, we filled the car with kids, sledges, spare clothes, flasks of hot drinks etc and drove to Barley near Pendle Hill. ..which B managed to do far more often than he managed to stay on board. I think he just enjoyed an excuse to roll around in the snow. A, on the other hand, didn’t need an excuse…. 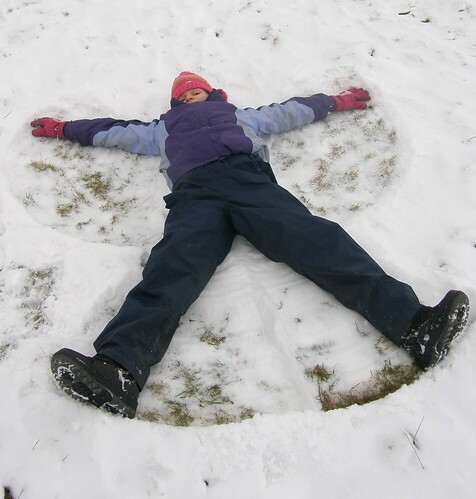 ….here she is making a snow angel. Incidentally, we can heartily recommend the Village Cafe in Barley where we were Royally looked after. Back in December, I was up-dating my Birkett Tick List and found myself toting things up. 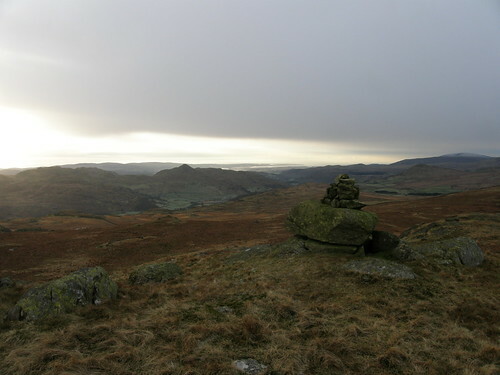 I realised that my Wainwright total (since I started this blog) stood at 99 and that my Birkett haul was close to 200. Well, I thought, one more bagging trip this year then to push both totals up to satisfyingly round figures. But it didn’t work out that way, what with the awful weather and the dreaded lurgy. But things have been looking up: I can manage the North Face of the stairs at home without oxygen tanks now, and last week the forecast for the weekend was showing some promise. So I began to ruminate on a route for a walk. It must include just one Wainwright. On the erroneous assumption that I’d reached 192 Birketts, I also decided that it must incorporate 8 Birketts. 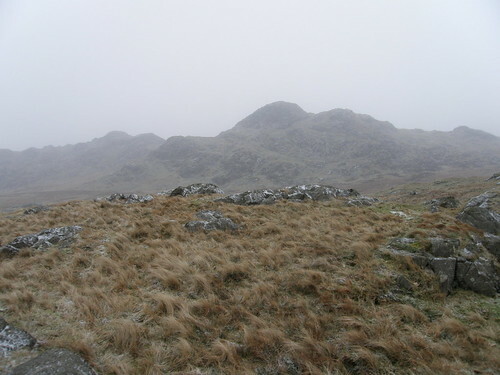 The forecast, when I started to look, promised clear summits, great clarity, and sunshine, particularly in the Western Lakes, so preferably it would be in the west. Finally, given my recent infirmity, it would have a high start and be both reasonably short and without too much ascent. Nothing too specific there then: should be easy to find something to meet those criteria. Surprisingly, it was: my first thought was ‘Green Crag’, and when I dug out the map and the guide books it came up trumps against every yardstick. 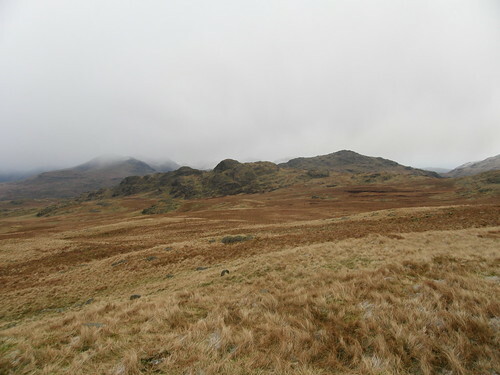 Birkett manages to find eight sufficiently distinct summits dotted about on Birker Fell, whilst Wainwright recognises only Green Crag. South and west from Green Crag the scenery quickly deteriorates. 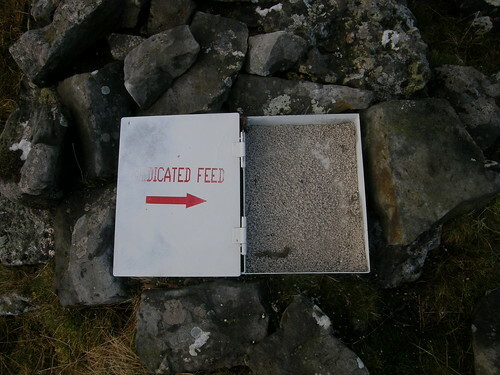 This summit has therefore been taken as the boundary of fellwalking country. 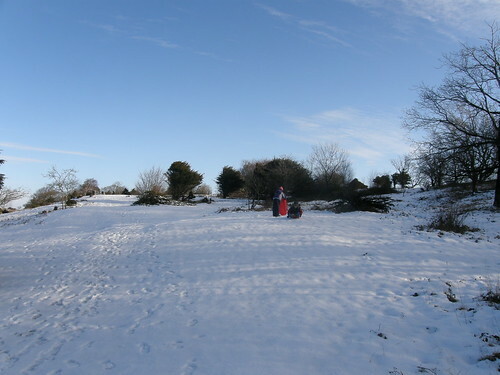 I pitched on Sunday for the expedition because the weather forecast suggested that it would be the better bet. 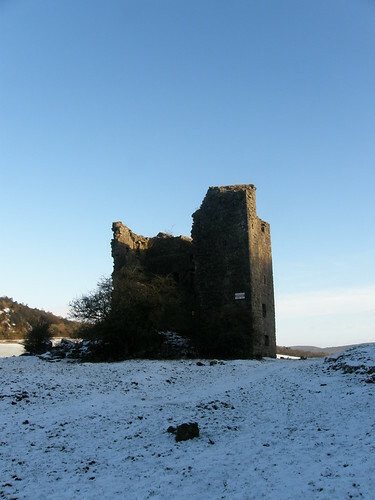 In the event, Saturday was clear and bright and I went out for a trial run locally with a quick stomp slow plod up Castlebarrow in Eaves Wood. All went well: no coughing fits and only a modicum of wheezing. I packed my rucksack and checked the forecast one last time. Calamity! 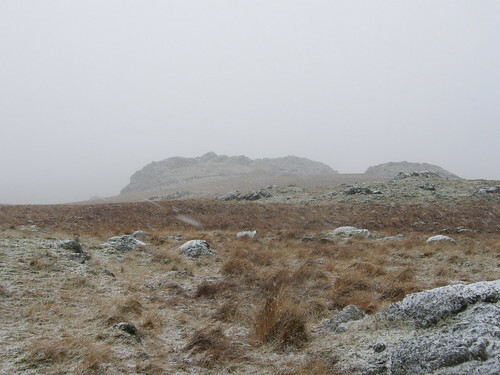 The forecast had changed: a weather front would be arriving sooner than first thought, high cloud would build leading to snow flurries in the afternoon. 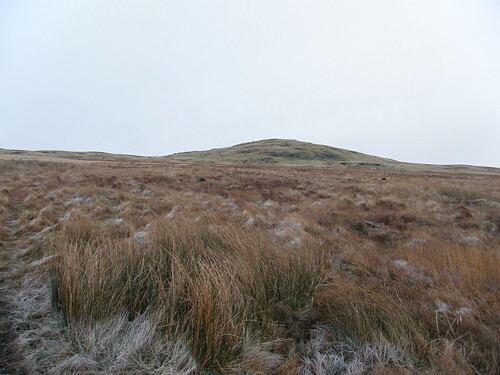 And so it was that I found myself pulling off the Birker Fell Road above Ulpha with a pre-dawn glow in the south-eastern sky, and then, appropriately, crunching my way up the bank of Freeze Beck on saturated, but mostly frozen, ground. When the sun rose the promise of sunshine was briefly fulfilled as several prominent peaks and knolls where daubed in a warm golden glow. This is not a steep climb, but I was making heavy weather of it and was glad to pause for a while to watch and listen as two skeins of geese flew overhead. 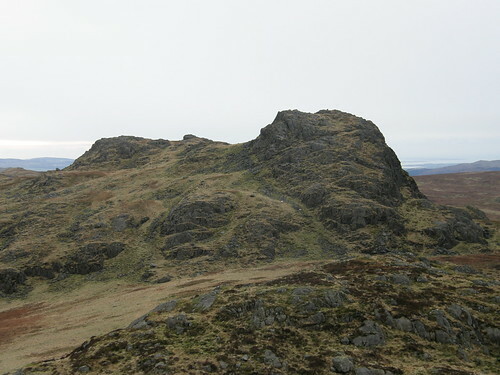 Great Worm Crag – first target for the day. With the sun very low in the sky, an orange glow persisted in the south east for much of the morning. The views in that direction, of the Black Combe hills, the Duddon Estuary and Caw, were very fine despite the heavy cloud cover. Great Worm Crag proved to be an excellent vantage point from which to reconnoitre the remainder of the route as it crossed a series of rocky knolls. On the crest of the moorland between the Duddon Valley and Eskdale there rises from the heather a series of serrated peaks, not of any great height but together forming a dark and jagged outline against the sky that, seen from certain directions, arrest the eye as do the Black Coolin of Skye. To the east of the Ulpha Fell road a line of dark, rocky but lowly peaks, like a miniature Cuillin ridge, attracts the eye. 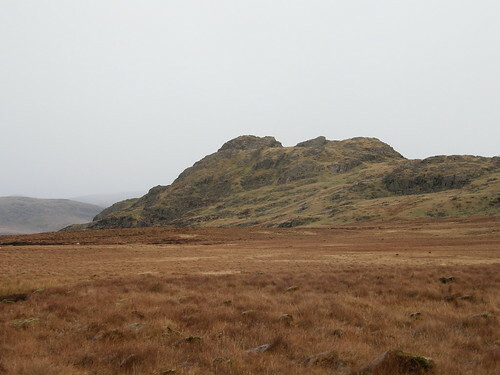 Now don’t get me wrong, I like Birker Fell and I shall be going back there, hopefully before too long, and I don’t wish to take issue with authoritative texts, but this is over-egging the pudding surely, a comparison too far. ‘Seen from certain directions’? If you squint. And close the other eye. And haven’t ever seen the ‘Coolin’. I can’t help wondering whether the Evans were, perhaps unconsciously, swayed by Wainwright’s analogy. Beyond Green Crag and its satellites, Upper Eskdale was filled with cloud and the big hills which surround it, looming presences in the mist, looked very menacing. 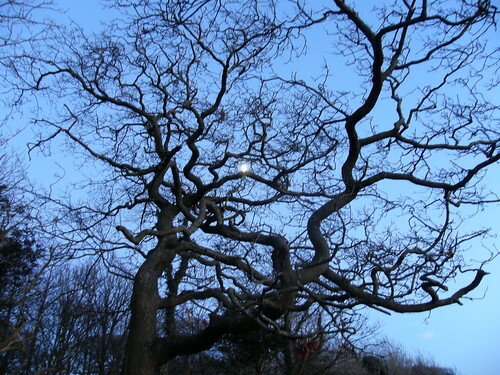 …but in fact it didn’t feel too cold since it was incredibly still, almost windless. I skirted White Moss en route for White How. A few flakes of snow gently drifted in the air. I stopped briefly for a hot drink and a second breakfast on White How. Although the weather was clearly closing in, the views were still fine. The cloud had lifted from Eskdale and sunlight fleetingly picked out the crags on Scafell Pike (whilst I scrambled in my rucksack for new batteries for my camera!). 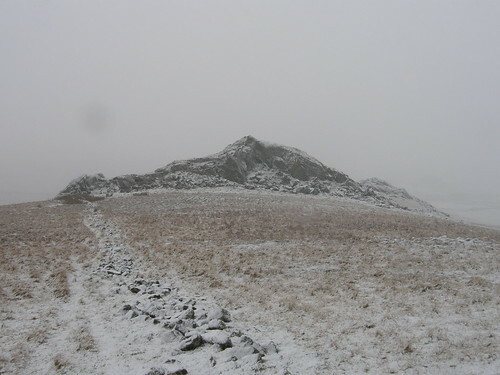 Stickle Pike, Duddon Estuary, Black Combe. Climbing Green Crag via a series of short steps with boggy level areas inbetween, I decided that Green Crag was more akin to an English Cnicht than an English Cuillin. 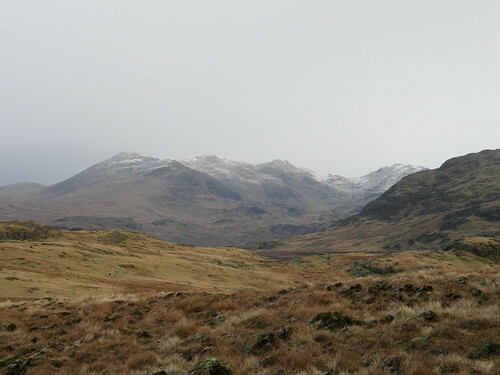 Wasdale and Eskdale Fells from Green Crag, Crook Crag in the foreground. 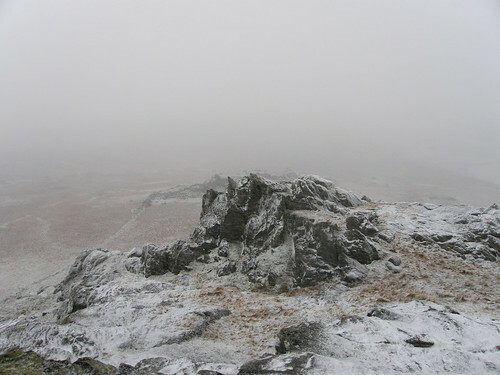 On the summit of Green Crag I remembered my only previous visit. 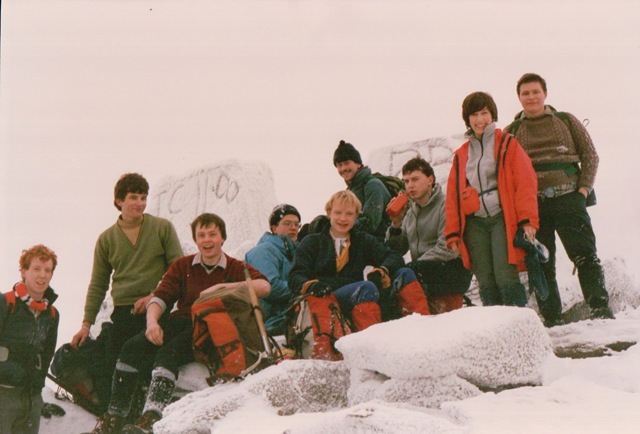 One sunny Mayday many years ago, with a group of friends who regularly appear on this blog, the principal things I recall are: a dreadful hangover, the pleasantly graded old peat road which brought us up from Eskdale, a lengthy scramble on accommodating rock, snoozing on the summit and getting sunburned as a consequence. 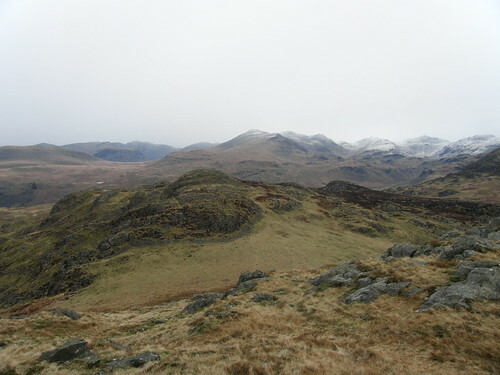 As I left Green Crag, heading for Crook Crag, I saw a largish group of walkers, approaching Green Crag from another direction, possibly via a scramble. They were to be the only other walkers I would see all day. In fact after the geese, the only company I saw on the hills were sheep. In the absence of wind, walkers and wildlife (to my surprise I didn’t even see or hear any ravens on what seemed like perfect raven territory) it was almost eerily quiet. 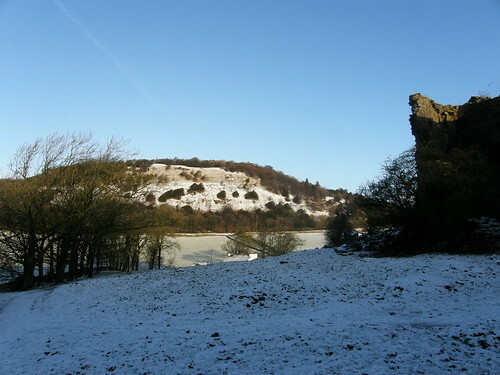 Kepple Crag would be almost an out-and-back. Logically and aesthetically it didn’t fit into this round. The weather was clearly deteriorating and I would have no views. 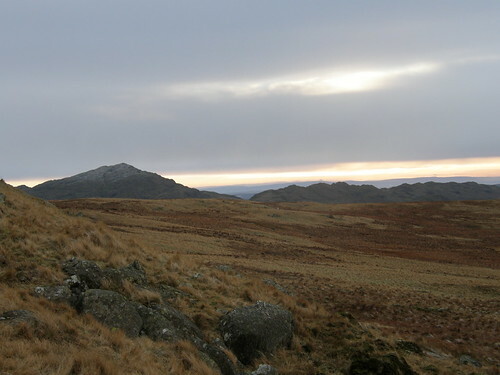 Leaving Kepple Crag for another day would give me an excuse to tackle these hills from Eskdale – to explore the peat cutters roads, to have a look at Birker Force and Low Birker Tarn, perhaps to take on those scrambles again. 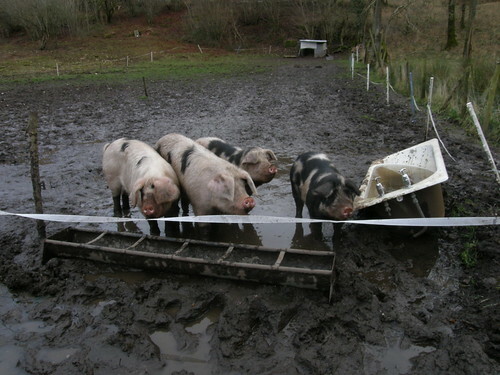 An early finish would enable me to get home and take S for our habitual Sunday afternoon swim. 7. Kepple Crag was downhill in the wrong direction and I really didn’t want to do it. And so I almost doubled back, heading now for Broad Crag. 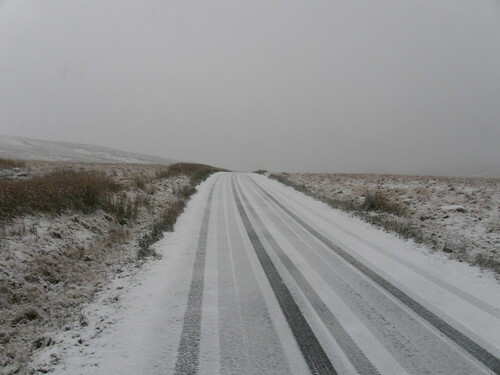 It was snowing in earnest, big white flakes coming thick and fast and rapidly settling. 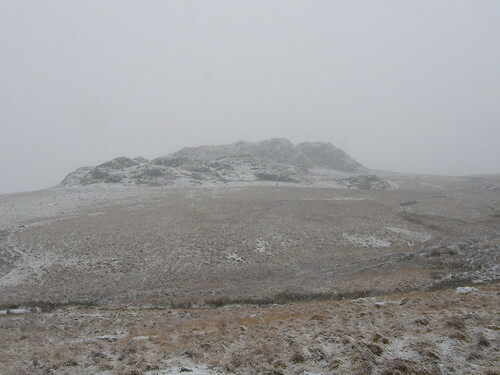 Visibility was worsening although still not sufficiently to seriously hamper navigation. Great Crag, the final Birkett of the day, from Broad Crag. Little Crag and Great Crag from below. 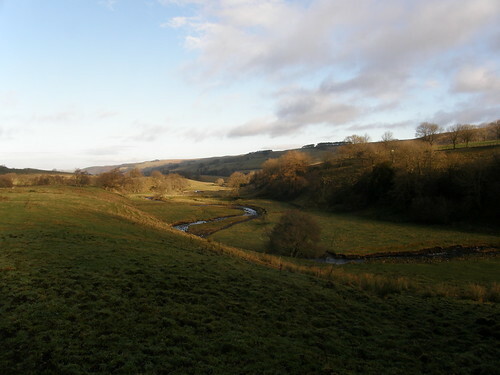 The area abounds in rocky tors and outcrops. 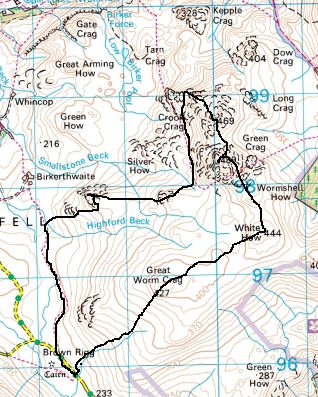 I passed or noticed several which, although not anointed by Birkett, looked well worth exploration: Rough Crag, White Crag, Dow Crag, Tarn Crag, Silver How and the intriguingly named Wormshell How for instance. Definitely a place for another visit. In retrospect, I was very glad of my decision to shorten the walk: any residual guilt about my laziness was dispelled. I’d had the best of the day, Kepple Crag will wait. 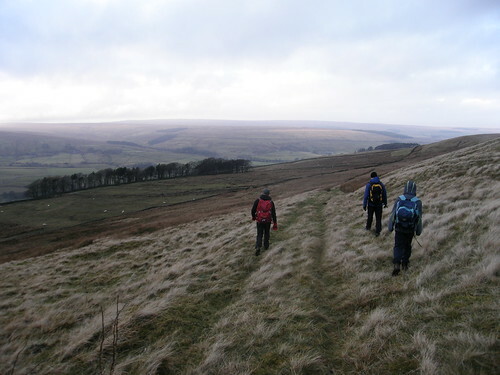 Birkett gives 4 hours for this walk. I did it in about 4 and a quarter, but then I missed a big chunk out. I’m sure it would make a fabulous summer evening walk. The day held one more surprise for me: near Spark Bridge on my drive home a large bird of prey swept low over the road and then soared away. Large black primary feathers and a flash of rufous red – surely a red kite! We spent the Christmas and New Year period here at home and barring an odd, brief, moment of respite, it was perpetually grey, overcast and damp. 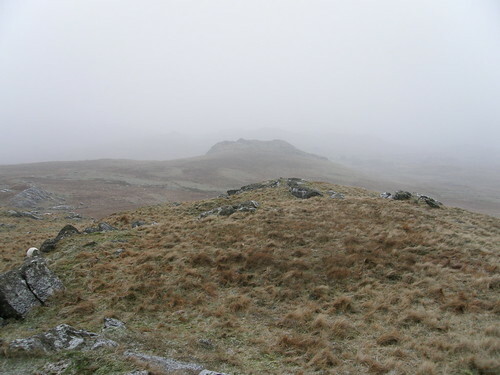 It wasn’t always actually raining, but when it didn’t rain it was foggy or misty, and wet – always wet. Meanwhile, the weather was mirrored by my own state, struggling with a persistent chest infection, full of mist and fog. It didn’t exactly lay me low, but just left me – well, like the weather – disappointing and damply pathetic. As a consequence we didn’t get out half as much as I would have liked. Even the slightest of inclines had me wheezing and coughing. 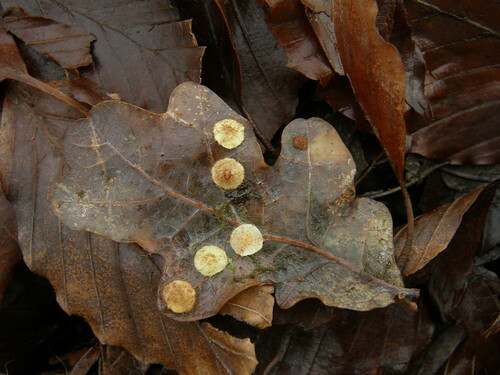 But, there’s always a bright side – these Gloucestershire Old Spots seemed quite content with the prevailing humidity. And we made the best of it at home. Whilst we weren’t getting out so much to see the wildlife – the wildlife came to us. Our garden was regularly visited by woodpeckers. 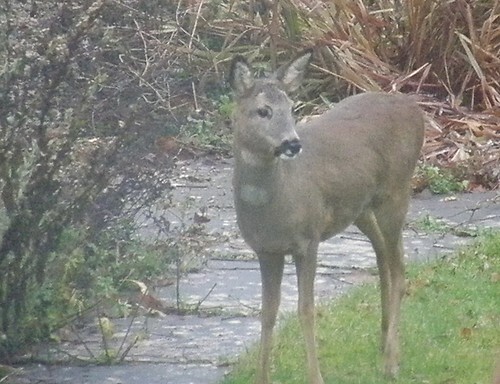 One morning it hosted…..
….a roe deer for a couple of hours. And then of course there were the joys of staying indoors: playing some games, watching a few films, just generally spending some time together without the usual hustle and bustle. 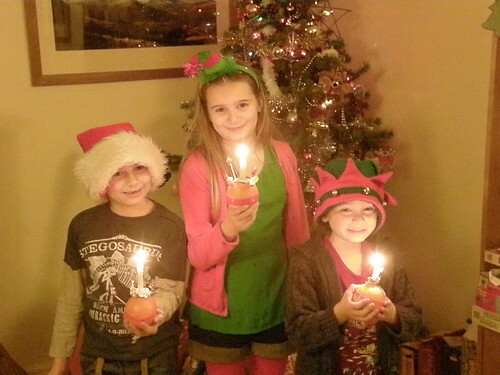 The kids did us proud and even cooked a family tea one evening, and breakfast the following morning. (Lentil and tomato soup, part-baked rolls, chocolate brownies. Porridge and pancakes – don’t worry we did help them with knives and ovens and such like). Now that I’m back at work, the weather has begun to turn colder, the wind will soon be in the North, and there’s the prospect of a little brighter weather at least. What’s more, a third course of antibiotics seems to be doing the trick, and it’s a real marvel to be breathing freely again. 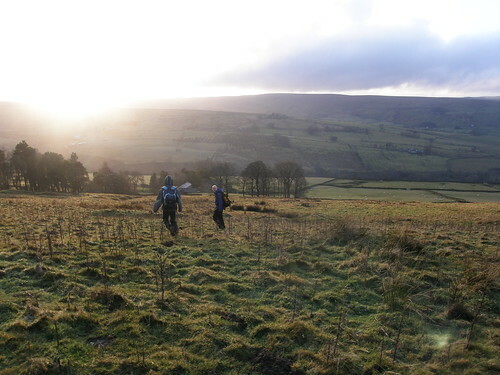 Time to make some plans for a proper walk…..
A third annual weekend at Ninebanks Youth Hostel and as before the Sunday was some what brighter than the Saturday, and as before some of us went for a wander across the valley and up to Greenleycleugh Crags. This party is the sleep-in-and-then-enjoy-a-huge-leisurely-breakfast-contingent and like last year we would meet the make-an-alpine-start-and-climb-every-knobble-in-the-vicinity-contingent early in our walk. 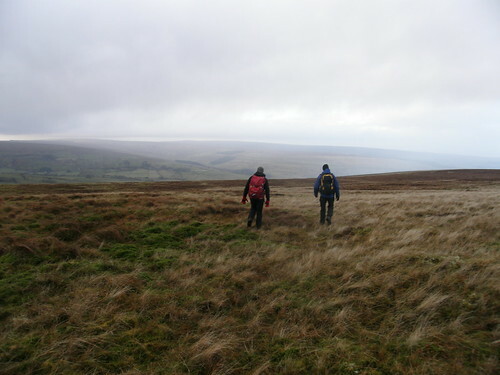 You can see the three of them, lean and gaunt fell tigers, in the distance in this photo. We stopped to chat for a while. The Hardman had apparently brow-beaten the Adopted Yorkshireman and the Madman into some Spot Height bagging on Hartley Moor. 574m was reportedly a little disappointing and featureless, but apparently 571m is a ‘cracker’. 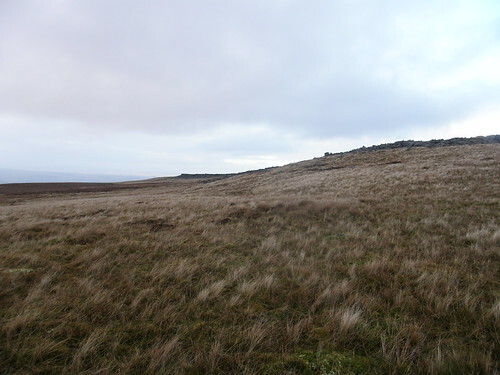 Not content with spreading his habitual scurrilous lies about the weather, the Adopted Yorkshireman tried to convince us that the moors were ‘surprisingly dry underfoot’ which obvious ruse didn’t take us in for even a nanosecond. As we continued over the Glyders the party dwindled. Only the Madman, Geordie Munro and myself finished over Elidir Fawr and down to Nant Peris. 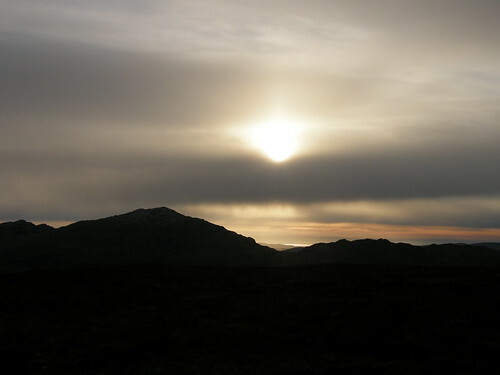 I was exhausted I remember, but unlike the other two, I hadn’t climbed all of the Carneddau in the dark the night before. I think we had a drink in a pub in Nant Peris whilst we waited for someone to come and pick us up and I think I may have fallen asleep before I’d drained my pint. Some of the days we recalled were more recent. Not all were winter walks. Some were more gentle affairs. I’m fairly sure I proffered the third day of this summer’s walk on Hadrian’s Wall with A and B as a particularly cherished recent memory. 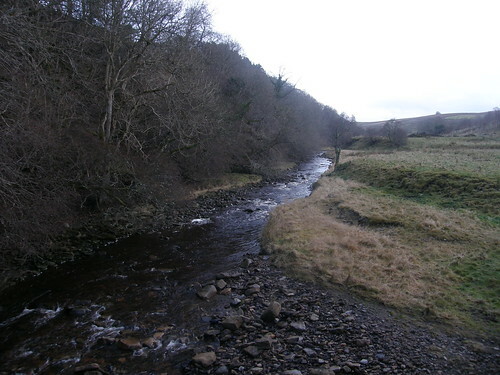 Since then, it has occurred to me that we concentrated solely on memories of particular days, but that we might have interpreted D-boys query differently, and thought about our favourite routes for a walk. I’ve opined before on the elements which come together to make for a good day on the hoof. 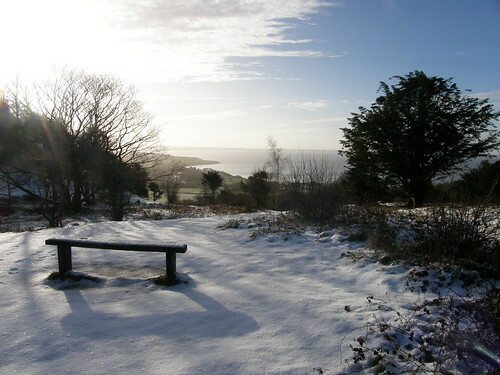 On this occasion, a sheltered spot out of the biting wind for a hot drink, and to share some left-over crumble and custard, was key. A bit of blue sky didn’t go amiss. A wildlife encounter always goes down well. We watched a kestrel strafing a buzzard over the fellside and on our way back to the hostel startled a couple of roe deer. Also, peace and quiet is the norm here. I don’t think we’ve ever met anyone else up on the edge formed by Greenleycleugh Crags. The only company this time was a host of grouse. 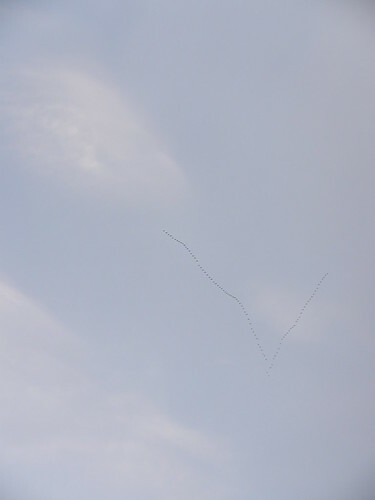 I don’t recall seeing them on either previous, snowy visit, but they were legion this time around. Judging by the number of these…. 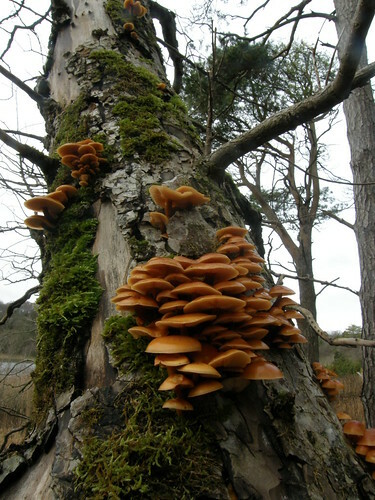 …we came across, somebody is working hard to see that the moors maintain a substantial population. Greenleycleugh Crags are hardly spectacular. 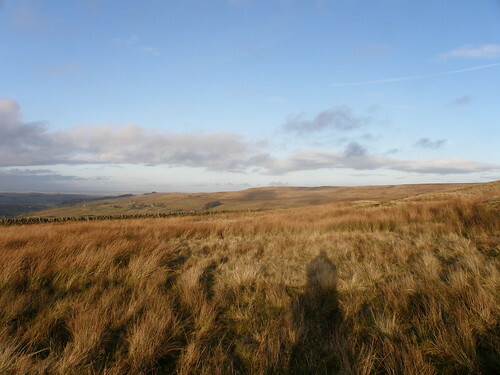 Nor are they remote – a road runs across the moor just below them. But, never-the-less, there’s something about the space, and the quiet, and the expansive views which is deeply satisfying. The Shandy Sherpa said that this route had become one of his favourites and I realise on reflection that I feel the same way. But this is a short afternoon walk with none of the drama or difficulty of most of the walks we’d recounted to D-Boy earlier. Of course, we’ve changed, and in more than simply the receding hairlines and expanding waist lines not yet evident in the Tryfan photo. But I think that there’s more to it than that. For a route to become a favourite, some familiarity is required. 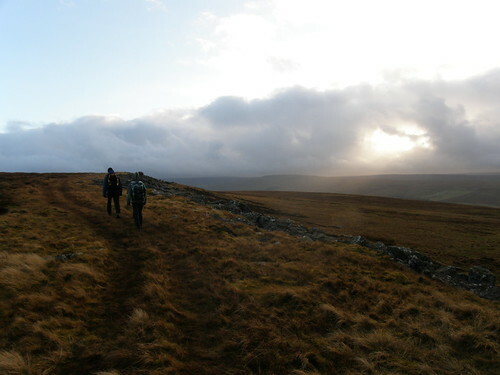 A favourite route, then, is one you’ve walked at least a few times, possibly on many occasions and probably in different conditions, seasons, times of day. 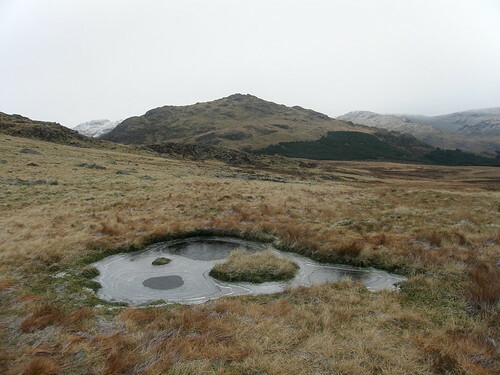 In the Lakes, a walk around Little Langdale and the paths into Upper Eskdale spring to mind, simply because I’ve walked them both on many, many occasions. 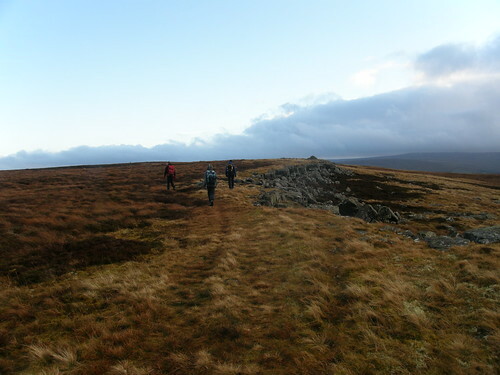 Accessibility is a key factor: when I lived in Manchester the walk from Old Glossop onto Bleaklow via Shelf Benches and Dowstone Clough was a favourite principally because it lay at the end of the 53 bus route and was therefore easily reached from home. 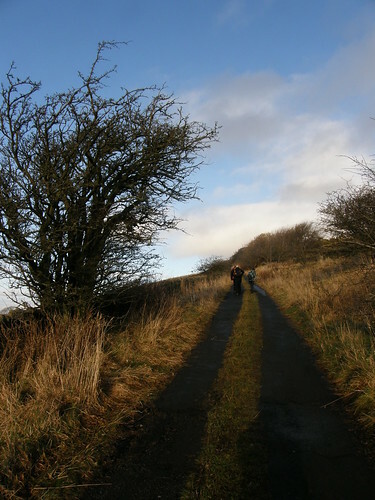 Don’t get me wrong: it is a fine walk too, with much to commend it, but I wouldn’t still feel such an affection for it, many years after I last went that way, if I hadn’t had the opportunity to walk it frequently in the past. 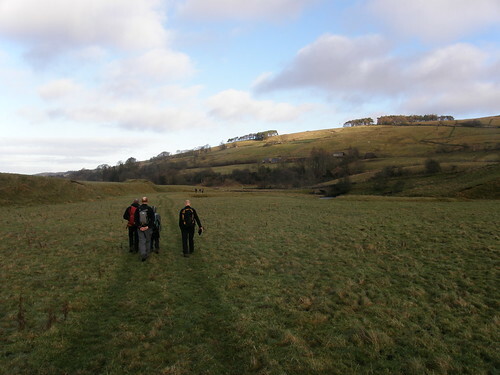 A current personal top twenty would inevitably include many of the familiar paths around home, but maybe Greenleycleugh Crags would be bubbling under…. 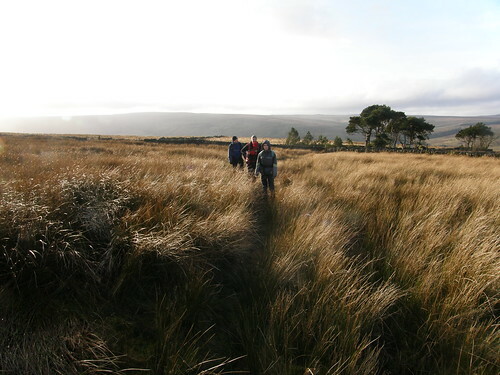 Which are your favourite walking routes? *But his seat number is available on application.